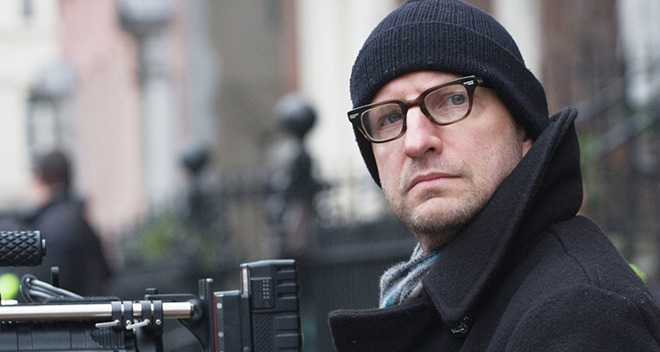 Echoing statements made last month, Soderbergh said he will find it difficult to return to conventional filmmaking after relying on Apple's device for principle shooting. Of note, iPhone's small size and superior image quality presented unparalleled flexibility in setting up and accomplishing shots. With its tiny format, Soderbergh was able to capture on location footage without punching holes in walls or securing bulky camera equipment to ceilings, reports Reuters. With its built-in screen and portable form factor, iPhone also allows directors to go straight from watching a rehearsal to shooting, Soderbergh said. There were, however, a few drawbacks inherent to iPhone's diminutive footprint. For example, the handset was very sensitive to vibrations, a characteristic that any smartphone owner can confirm. Whether Soderbergh enabled iPhone's hardware- and software-based image stabilization features is unknown, but both have the potential to reduce image quality. "I have to say the positives for me really were significant and it's going to be tricky to go back to a more conventional way of shooting," Soderbergh said. "The gap now between the idea and the execution of the idea is just shrinking and this means you get to try out more ideas so I wish I'd had this equipment when I was 15." Soderbergh made similar statements in an interview last month, saying iPhone's 4K footage looks like "velvet" and calling the device a "game changer." Joshua Leonard, who co-stars alongside Claire Foy in "Unsane," said iPhone allowed the actors to stay immersed in the world of their character and that of the story while filming. Traditional movie sets often play host to large camera rigs, audio and lighting hardware, dollies, cranes and other equipment. "There's nothing more fun as an actor than just being in the thick of the creative process when you're actually on set and not having to wait for the machine of filmmaking to catch up with the creative impulse," Leonard said. Alongside Leonard and Foy, "Unsane" features Jay Pharaoh, Juno Temple, Aimee Mullins and Amy Irving. Pharaoh describes the film as a psychological thriller along the lines of Jordan Peele's "Get Out." The movie was shot last summer, suggesting an iPhone 7 or iPhone 7 Plus was used during filming. "Unsane" makes its debut as one of about 400 films at the festival, but the movie is not up for the event's main prize, the Golden Bear.